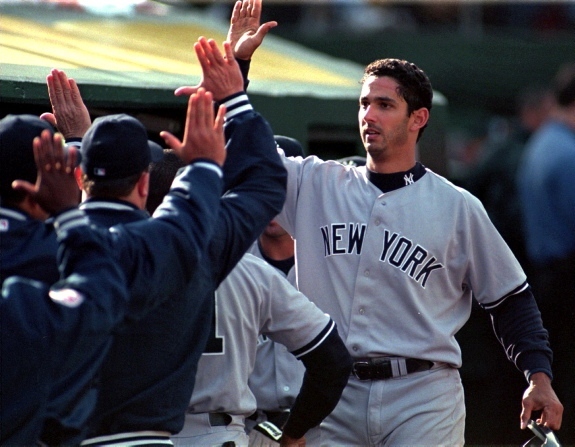 When Jorge Posada made his Major League Baseball debut on Sept. 4 1995, he got to Yankee Stadium early. The 24-year-old switch-hitting second baseman-turned-catcher walked from the clubhouse down the tunnel to the dugout to soak in what would become his home for the next 17 seasons. Posada looked around at the majesty of Yankee Stadium. Tears of joy filled his eyes. In the years that followed he afforded the Yankees and their fans countless unforgettable moments, and basically became the Bronx Bombers’ unofficial co-captain. A leader, a gamer, and one of the most intelligent and fiery Yankees to ever don the pinstripes, Posada, 40, is expected to announce his official retirement from baseball in the coming weeks. The Yankees will lose one of the “Key Three” members of their Championship Dynasty of the late 1990s. 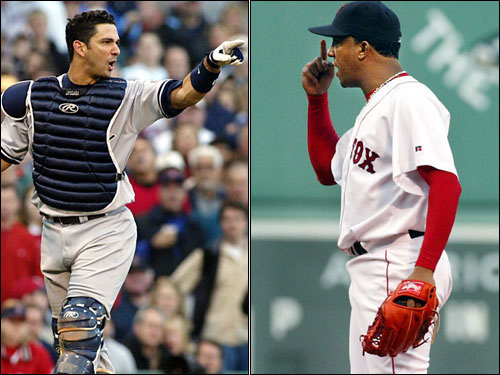 Off the top of my head I can come up with a number of Posada’s best moments as a Yankee. Here are some of his most memorable achievements; a few of his accomplishments that made him such a special Yankee. Although Posada got the call to the show in 1995, he didn’t become a full-time player until later on in his career. 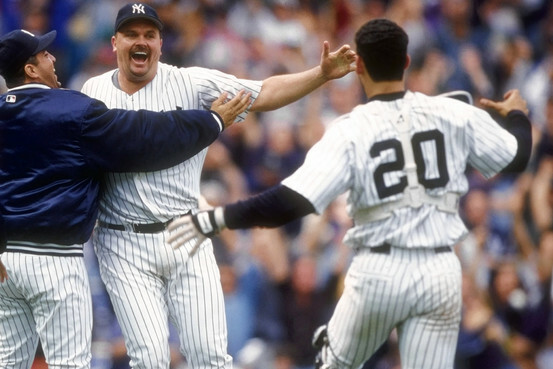 In ’97 he replaced Jim Leyritz as backup catcher to current Yankee manager Joe Girardi, who was filling the position as the Yanks’ everyday backstop. Posada started 52 games behind the plate in 1997 and played in a total of 60 games for the season. He only managed to smack six homers and knock in 25 runs for the season, but had a sort of “coming out party” in 1998. An old baseball adage suggests that having a catcher that can hit is a bonus – and the Yankees had that bonus. At the plate Posada crushed 17 homers and batted .268 while recording 68 RBIs in ’98, but arguably his best feat of the year came defensively, on May, 17, 1998 when he caught David Wells’ perfect game at home against the Minnesota Twins. When a pitcher throws a perfect game, sometimes it gets overlooked that the catcher is the one calling the signs, and most of the time the first person the pitcher credits after notching the perfecto is the catcher. It takes the battery of a pitcher and a catcher to complete a perfect game and Wells recognized that, rewarding Posada and the rest of the team with diamond rings when it was all said and done. 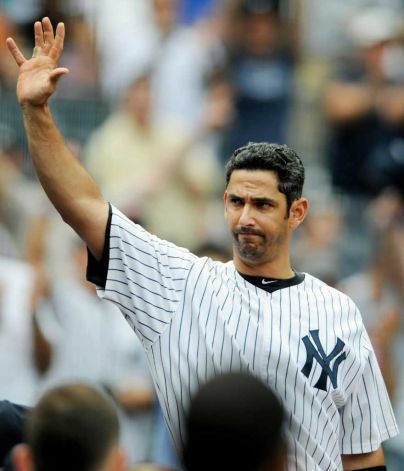 Before the Yanks moved into the new Stadium in 2009, Posada was asked what his favorite moment in the old Yankee Stadium was. His answer was simple. Posada and the Yanks capped 1998 with a World Series title, their second in three years. In ’99 he appeared in 112 games and hit 12 homers, knocked in 58 runs, and averaged .245 at the plate. 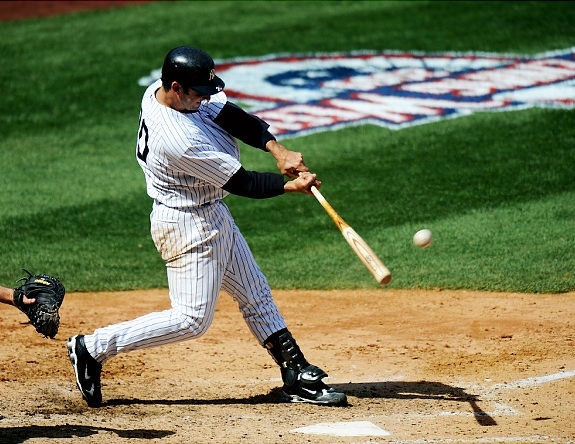 The Yankees once again won a World Series title in ’99 and again in 2000 – which to that point was Posada’s best year numerically: 28 homers, 86 RBIs, and a BA of .287. For his outstanding numbers he was selected to his first of five All-Star games in the year 2000. In 2002 Posada started the Midsummer Classic and during player introductions a Posada took the field – but it wasn’t Jorge. Well, it was, actually. Posada’s son Jorge Luis, who has craniosynostosis (a bone condition which affects the skull of an infant), dashed out onto the baseball diamond when Posada’s name was called. The short man was playfully wrangled by Yankee nemesis and then-Red Sox player Manny Ramirez, who presented Jorge Luis to his proud father. You Talkin’ to Me, Pedro? Posada pieced together one of his best seasons in 2003, clubbing 30 homers to become only the second Yankee catcher along with Yogi Berra to ever hit 30 home runs in a season. He also drove in 101 runs, batted .281, and scored 83 runs. At the end of the year he finished third in the American League Most Valuable Player voting, showing just how important he was to his team. But all of that was basically overshadowed by the biggest rivalry in sports. In ’03 the Yankees and their archenemies, the Boston Red Sox, played in some heated games. Over the summer Derek Jeter and Alfonso Soriano were beaned with fastballs by the hated Boston ace Pedro Martinez. Roger Clemens, the Yanks’ outspoken number one hurler, plunked Kevin Millar in retaliation. As fate would have it, the Yankees and Red Sox met in the 2003 American League Championship Series; the winner would go to the World Series. Both squads were not shy about their feelings towards one another, as they exchanged words in the media. You couldn’t open a newspaper or turn on ESPN without hearing what the Yanks and BoSox were saying about each other. The ALCS was tied 1-1 and with tensions running high, all Hell broke loose in Game Three. Yankees’ right fielder Karim Garcia was hit on the back by what looked like an intentional bean ball thrown by Martinez. Garcia didn’t take kindly to Martinez’s throw – and neither did Posada, who began to mouth off to Martinez from the dugout. Things settled down and the game resumed after awhile, only for another fracas to begin in the next half-inning. Clemens threw a pitch high and tight to Ramirez; clearly no intent, yet the Boston left fielder tried to charge the mound and the benches cleared. Don Zimmer, the Yanks’ 72-year-old bench coach, was tossed to the ground by Martinez in the brawl, proving just how ugly emotions between the two teams really were. But after a single by Bernie Williams that scored Derek Jeter, and a ground-rule double by Hideki Matsui, Posada stepped up to the plate in a huge situation: runners on second and third with one out. And he was as clutch as can be. Posada popped a blooper into shallow centerfield, a hit which no Boston outfielder or infielder could come up with. Williams and Matsui came to the plate to tie the game while he wound up on second base. Fired up, Posada clapped his hands together and pumped his fists in jubilation. The game-tying bloop double set up Aaron Boone’s glorious home run in the bottom of the 11th, sending the Yankees to the World Series for the 39th time and the Red Sox home for the winter. If it weren’t for Posada’s gritty, “never say die” attitude and his piece of late-game clutch hitting, Boone never would have had the chance to swing his bat in the 11th; the Yankees may have been doomed in the ‘03 ALCS. As far as the Martinez-Posada feud: the two publicly expressed how they felt about one another: they both said they disliked each other. However aside from the argument in the ’03 ALCS, nothing physical ever transpired between the two. Unless you count the four career home runs Posada hit off Martinez. On a side note, over the course of his career Posada hit 275 home runs. The most he smacked off a single pitcher: five off another Red Sox hurler, Tim Wakefield. Of course I had. It was one of the most improbable and incredible comebacks ever. On May 16, 2006 the Yankees had been getting creamed by the Texas Rangers at home. In fact, through the first two and a half innings the Bombers were losing 10-1. But they never gave up, slowly chipping away at the deficit. The Yanks were able to knot the game at 12 before the ninth inning, only for Texas to plate a run on a Rod Barajas double and take a 13-12 lead going into the Yanks’ final set of at-bats. When it looked as though the rally was for naught, Posada clubbed a game-winning two-run home run in the bottom of the ninth off Rangers’ closer Akinori Otsuka to complete the comeback and give the Yankees a serious come-from-behind, 14-13 win. Posada drove in five of the Yanks’ 14 runs and also showed off his strength, as he survived a collision at home plate with future teammate Mark Teixeira. Posada nailed Teixeira at home plate for an out, but after the game admitted it was the hardest he had ever been hit. “I never played football in my life,” Posada told the press after the game. One could argue that by age 35 most catchers are reaching the so-called “downhill side” of their careers. Their offensive numbers seem to dwindle and they just aren’t the same players they were at, let’s say, age 25. That never happened to the Yankee catcher. In 2007 Posada recorded the highest batting average of his career, securing a BA of .338. He also posted the highest slugging percentage of his career with .543 and for the first time since 2003 he made the All-Star team. The rest of his numbers also looked solid: 20 homers, 90 RBIs, 91 runs scored, 42 doubles, and he even stole two bases. With his ’07 power show he became the first catcher in MLB history to average .330 or better, record at least 40 doubles, hit 20 homers, and knock in at least 90 runs in a single season. 2007 was a renaissance year for the backstop, and you might say Posada turned 35 into the new 25. 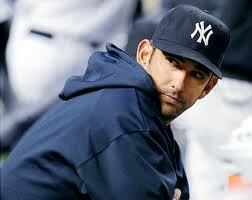 In a little comic relief, Posada starred in an ESPN commercial with hated Yankee killer David Ortiz. When I first saw this, I couldn’t get enough of it. After the 2008 season wrapped, the Yanks moved from their beloved cathedral to their new house across the street. They started the 2009 season on the road, but on April 16 it was time for Opening Day in the new ballpark in the Bronx vs. the Cleveland Indians – and it was a day of firsts. Babe Ruth hit the first home run in the old Yankee Stadium, and in the fifth inning Posada became the first player to homer in the new Yankee Stadium. He took a pitch off Cliff Lee deep to centerfield, a poetically just shot that landed in the netting above Ruth’s monument. Unfortunately the Yanks had a bad day, dropping their first game at home 10-2. After the game Posada was proud to have done what Ruth did in terms of christening the ballpark, but was unhappy with the final score. Yankee manager Joe Girardi could not have been happier that his successor was the first player to homer in the new Stadium. Resiliency (noun) – the ability to recover from, or adjust easily to, change or misfortune. Resilient (adjective) – the ability to withstand, or recover quickly from, difficult conditions. There is no better way to define the 2009 New York Yankees. ‘09 was a magical season for the Bombers. Solid pitching, all-around hitting, and if the score was close late in the game, you could almost be certain the Yankees were going to win. The Yanks played the LA Angels at home on May 1, and squandered away a 4-0 lead when the Halos plated six runs in the sixth. They added three in the seventh and it seemed as though the Yankees were well on their way to an inevitable loss to the Angels, the only team in baseball with a lifetime winning record against the Bombers. The Empire struck back in the eighth scoring four runs, setting the stage for one of their many comeback victories. Posada came up to bat in the bottom of the ninth with Teixeira and Angel Berroa aboard, and whacked a two-run game-winning single to finish the game, his first walk-off hit of the year. When it was all said and done teammate A.J. Burnett gave Posada a whipped cream pie to the face, a tradition that became custom after every walk-off Yankee victory. And there were more pie orders to fill. On July 4 the Yanks hosted the Toronto Blue Jays and played them to a 5-5 tie into extra innings. In the bottom of the 12th Posada came up and singled home Alex Rodriguez, giving the Yanks a 6-5 walk-off win on America’s (and George Steinbrenner’s) birthday. The game-winner may have been huge but it wasn’t all Posada did in that game. In the fourth he smacked a solo round-tripper, which at that point in the game gave the Yanks a 3-2 lift over the Jays. The Yankees’ resilient nature brought them to the World Series in 2009 for the 40th time and the first time since 2003. They squared off with the Philadelphia Phillies and in Game Two (after dropping the first game of the Fall Classic) the Bombers needed a win at home. Facing a familiar adversary, Pedro Martinez, the Yanks trailed 1-0 heading into the bottom of the fourth. Teixeira came up and knotted the game at one with a solo homer. Hideki Matsui followed suit, breaking the tie with a solo home run of his own in the sixth. Clinging to a small 2-1 lead in the seventh, Posada gave the Yanks a little breathing room. 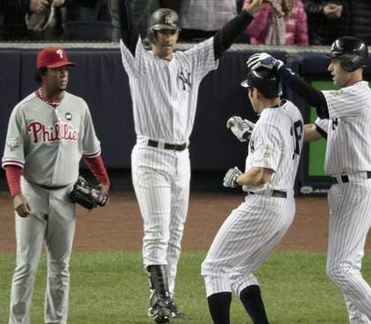 He hit a seeing-eye single off reliever Chan Ho Park to plate Jerry Hairston, Jr. and the Yanks went ahead, 3-1. They would win Game Two by the same count. In June of 2010 Posada had a chance to flex his muscles. On June 12 in an interleague matchup at home vs. the Houston Astros, he clubbed a grand slam off Wandy Rodriguez in the bottom of the third, breaking a 2-2 tie to give the Yanks a 6-2 lead. They went on to win 9-3 on the strength of Posada’s go-ahead trip to granny’s house. The very next day, June 13, he crushed another grand slam in the fifth inning off Brian Moehler, giving his team a sizeable 7-1 lead. The Bombers once again were en route to another win, a 9-5 decision over the Astros. With his two slams in two days, Posada became the first Yankee since Bill Dickey in 1937 to homer with the bases loaded in consecutive games. Ironically enough, Dickey was also a catcher. 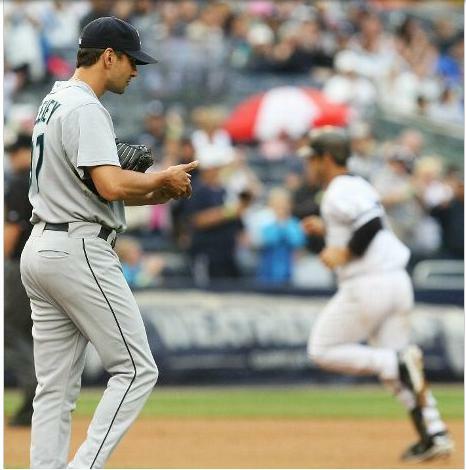 On Aug. 22, 2010 vs. the Seattle Mariners at home, the Yankees practically had the game won in the fourth inning. Austin Kearns hit a solo homer in the fourth, which was pretty much all the offense the Bombers needed because CC Sabathia was in shut-down mode, setting down the Mariners hitters one by one. The game turned into a stinker for Seattle in the fifth when Robinson Cano clubbed a grand slam. The Yanks added three runs in the sixth to distance themselves even further from Seattle, who did not put up any runs in the game. The Mariners eventually called on Brian Sweeney, a relief pitcher whom I have interviewed, in a mop-up situation. Posada came to the plate to face Sweeney and took his changeup for a ride into the right field seats, giving the Yankees a 9-0 lead. The Bombers would add another run in the eighth on an RBI single off the bat of Marcus Thames, winning by a knockout score of 10-0. For this writer it was bittersweet. I was happy for Posada; that he hit a home run for my favorite team, yet at the same time I was unhappy and I felt bad. I would have liked to see Sweeney maybe get a strikeout, being that he and I both came from the same college. From the experience, I can say this: it feels weird wanting to simultaneously root for both the pitcher and the batter. 2011 was a rollercoaster of sorts for Posada. There were ups and downs, lefts and rights. He was removed as the Yanks’ everyday catcher and made to be the team’s designated hitter. Everyone knows about the mountain made of the molehill when he took himself out of the game on May 14 against the Boston Red Sox, and he was limited at best when it came to playing. On Aug. 13, his first start since the benching incident, he was 3-for-5 with a grand slam and six RBIs. It marked the 10th slam of his career and with it he passed Mickey Mantle and Yogi Berra on the all-time Yankee grand slams list. Later in the month on Aug. 25 Posada played second base for the first time in his career, fielding the position in the ninth inning. He recorded the final out in the Yanks’ 22-9 win over the Oakland Athletics, cleanly taking a grounder and completing the 4-3 putout. He might have had a perfect frame at second base, but on Sept. 10 against the LA Angels he returned to familiarity. Russell Martin was injured behind the plate by a foul tip and Francisco Cervelli was unavailable to catch due to concussion-like symptoms. Girardi had no choice but to allow Posada to catch – and he made it count, throwing out Howie Kendrick attempting to swipe second base in the third. The Yankees made the postseason for the 16th time in Posada’s career and for his last playoff series, he performed extraordinarily well. He recorded six hits – one of which was a triple – scored four runs, drew four walks, and at the DH position notched a .429 batting average with a .579 on-base percentage. Not bad for his last hurrah. 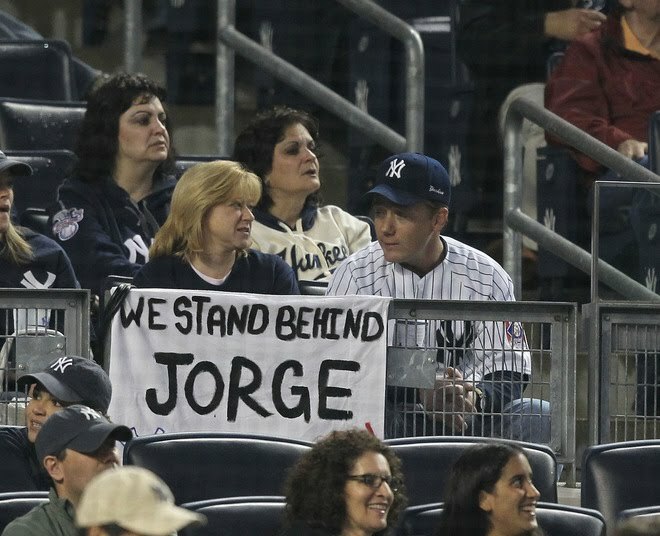 The Yankees and their fans will never forget Jorge Posada. He spent his entire career in pinstripes, somewhat of a rarity these days; not a lot of players in this day and age remain with one team their entire career. Girardi, who has always been close to Posada, credits him for a lot of the strength the Yankees showcased throughout the years. Friend and teammate Derek Jeter once said Posada would make a great baseball manager someday. Who knows. Posada succeeded Girardi once in his life – as the Yankees’ everyday catcher. 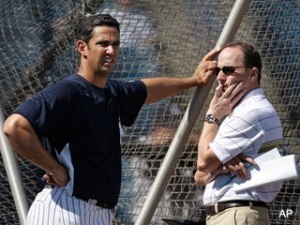 Maybe in the future he will succeed him as Yankee skipper. I’m not going to try and argue right now about whether or not Posada is worthy of the Hall of Fame. It doesn’t matter to me; whether he makes the Hall of Fame or not, he’ll always be a real Yankee soldier in my eyes. 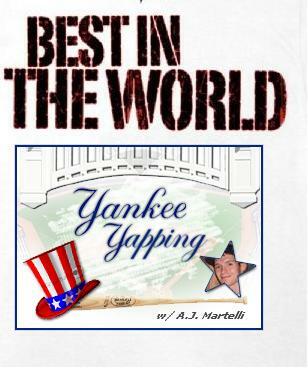 Yankee Yapping would like to thank Jorge Posada for all the memories and congratulate him on a wonderful career. I don’t know if the team will be the same without him, but nonetheless, we love him.